Granville County is located north of Raleigh on the Virginia border. The population as of the 2010 census was 59,916. The county seat is Oxford. The county was named after the Earl of Granville, a descendant of one of the Lord’s Proprietors, who were originally given the land by King Charles II in 1665. The area was settled early on by farmers from Virginia who grew tobacco. Slavery was pervasive here and was an institution used in the production of tobacco. In the antebellum era, the county was prosperous, this prosperity continued with the discovery of bright leaf tobacco. Historically, Democrats were very strong here, and Granville County residents were slow to abandon the party of their fathers and grandfathers. There is still a strong Democratic presence in the county but most of their support now comes exclusively from African Americans. Mitt Romney received the support of 3/4ths of Granville’s whites. The county experienced a population boom during the 2000s decade, but population growth has come to a standstill in the midst of the recession. Given its proximity to rapidly growing Wake County, it is possible some spillover of growth will come in the near future, as has been the case in Chatham, Johnson, and Harnett counties. But this has not happened so far. Forecast: Granville is an inelastic county due to racial polarization in voting. Whites vote Republican, blacks vote Democrat, especially at the federal level. 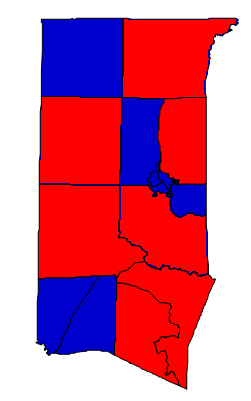 Granville’s election results are often determined by turnout. Republicans made steady progress in Granville County towards the turn of the 21st century; George W. Bush even managed to carry the county in 2004 as socially conservative white voters left their old Democratic Party. But the registration effort on the part of the Obama for America undid all that. Richard Burr carried the county by only 34 votes in his 2010 landslide reelection bid, an indication that many newly registered voters had decided to stick around. Because 2010 represented a perfect scenario for the Republican Party, and because of the inelasticity inherent in Granville’s voting patterns, Democrats should be favored here, even in midterm elections. One bright spot for Republicans here is that the white population is growing faster than the black population. But the Hispanic population is growing fastest of all. Thus, Granville is slightly less white than it was in 2000, but the pace of demographic change has not been as rapid here as in other rural counties. The towns of Creedmor and Stem were the fastest-growing in Granville during the 2000s decade. It would be prudent to examine precinct data from several elections in order to ascertain the political leanings of Granville’s newest residents.